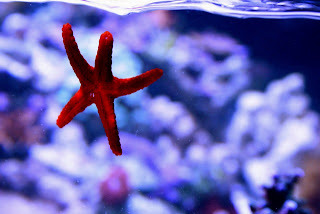 This blog is dedicated to observing the life of a Marine Ecosystem. Self explanatory. More details to come on this style of setup. 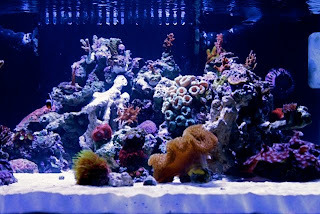 The 29 Gallon Biocube was recently dissembled. 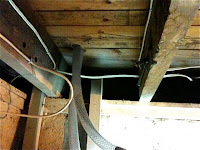 The contents were added into a larger more diverse system. 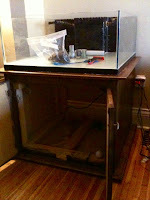 Here are some photos (iPhone only) of what is the beginnings of a custom built 47 gallon, shallow, rimless cube. The system is a sleek shallow rimless design made with all Starphire glass dimensions are 30x30x12. 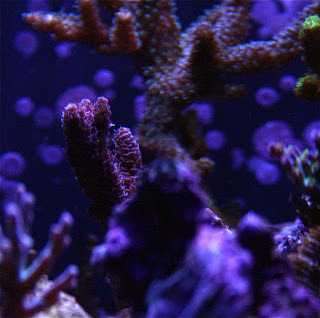 For preferable aesthetic placement and optimal drilling access the new tank had to be placed in the same location as the already existing Biocube which obviously creates an obstacle, all the livestock from the drained 29 gallon tank was stored in a clean rubbermaid bin with a heater and two Nano Koralias. 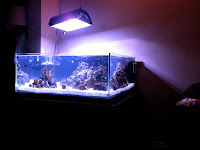 All new substrate was used and a lot of new water had to be made to fill the extra 40 gallons of volume but almost everything for the previous system was used. 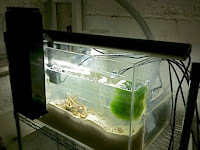 There was a small re-cycle in the system due to loss of a lot of beneficial bacteria in the old sand but the extra water, sump space, massive DSB and Refugium helped to keep the entire cycle under 2 weeks. 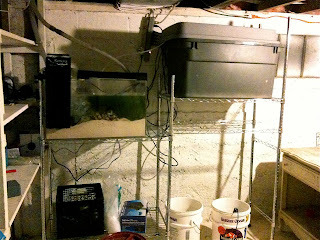 The Setup is plumbed into a 30 gallon basement sump in a room that has inevitably been dubbed the "fish room." After all the plumbing was finished the livestock was added. 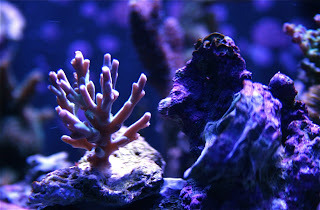 Last but not least... here are the first attempts at an aquascape... water was still a bit cloudy from new sugar sized sand but you can get the idea. Its been two and a half weeks since this upgrade and so far so good. 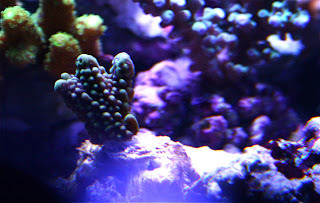 Corals and the paired black clowns seem happy. I had been testing for ammonia and nitrite frequently over first week and within 7 days all levels were zero and the system was producing nitrate. 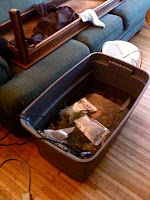 Small algae blooms appeared on day 3-5 but were gone quicker than they came. This quick cycle could have something to do with adding a small carbon source as I was dosing 0.3 ml of vodka daily. That dose is now up to 0.4ml daily and the effects are unbelievable. 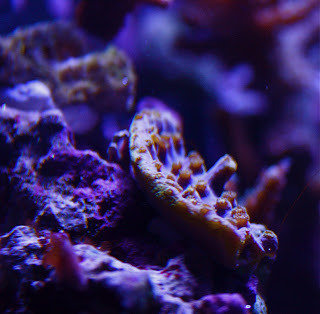 As you can imagine the SPS showed severe browning from stress during the move, this brown tinge is clearly visible in these shots as the entire system looks quite brown. 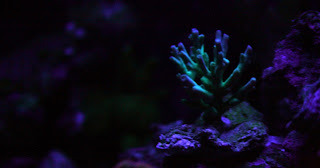 Under three weeks later the SPS colors are brighter than ever before and the water looks crystal clear. 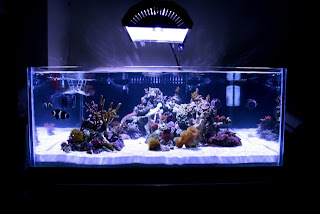 I don't recommend upgrading a tank using this "do it in a day" method if you don't have to. In this case: in order to drill into the basement and keep the tank in the living room the only option was to put it in the same place as the existing system hence the tiring all weekend affair of upgrading with a basement plumbing mission. 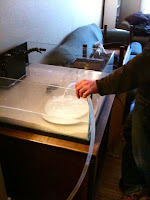 Ideally you would set up the new system have it run and cycle for a while before beginning to add livestock. Huge changes. 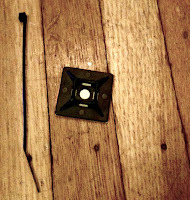 The Cube is no more. 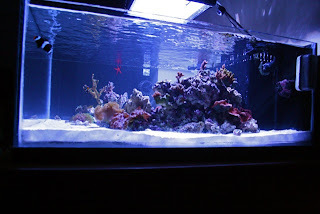 It is now a Custom 47g Shallow Rimless. Major updates to come around here, in the meantime here's a video of the new setup. 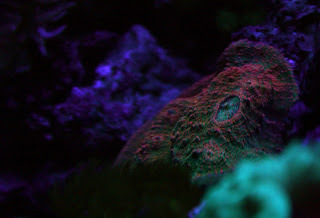 A few shots under actinics only. 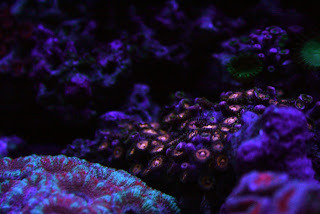 Several SPS frags were added to the system. 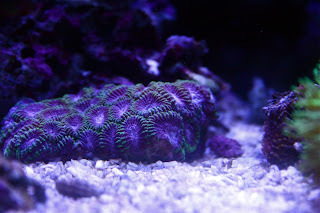 The large red Lobophyllia was sold to create room for smaller frags so a bit of an re-aquascape and a coralscape took place. 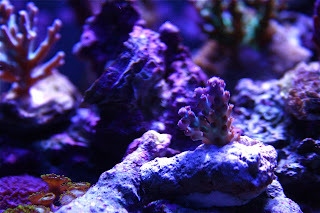 Here's a few shots of the frags and the new FTS. 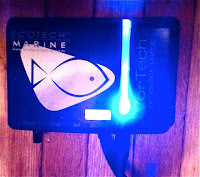 A Eco-Tech Vortech MP10 wavemaker was recently added to the aquarium. 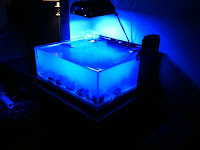 This anticipated addition comes in an exquisite package including all the parts you need to convert your water motion setup into a lifelike ecosystem. 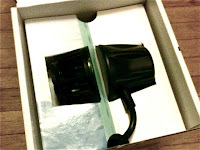 These little pumps cost a fair bit of change, however the reviews and user feedback is overwhelmingly positive. Of course in a nano setup where every inch counts and more importantly every degree of heat counts, an all in one wavemaker pump that has a tiny in tank footprint and virtually no heat transfer is almost a must. The pump took a few minutes to set up, and was up and running in no time. The pump tank mount was applied to the glass to prevent falling damage, and a provided rubber spacer was placed between the magnets to ensure no damage is done to the motor due to thin Biocube glass. 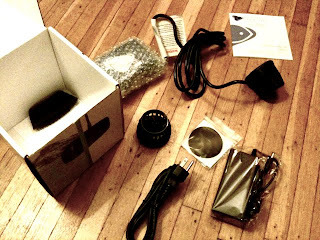 The included instruction manual obviously provides a step by step and the directions are incredibly easy to follow. After a few seconds of alignment and playing with the pump settings it was time to begin programming wave modes. 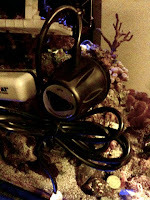 Currently the pump is running in "Short Pulse Mode" which is one of several modes including "Reef Crest Random," "Lagoon Random," "Constant Speed," and "Long Pulse." 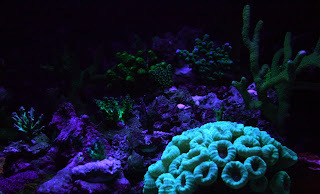 The adjustable"Short Pulse" mode was timed to generate a pulsing wavelike turbulence used to simulate the swaying motion of coastline reef. 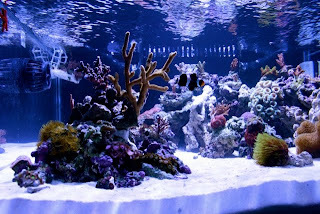 The mode uses a repetitive burst of current that, with a little tuning, can be synced with the rebounding waves to create a visible motion across the aquarium. 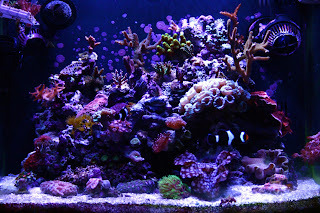 Originally the "Reef Crest" mode was selected as an operating mode, but if your system is physically stable with short pulse you can get a little wave bouncing back and forth in your tank meaning it's not just your pump doing work as the momentum of the waves make everything sway. The interface could not be easier with a glowing color coded LED light identifying the modes, two buttons for mode and set functions, and a knob controlling pump power and wave frequency. 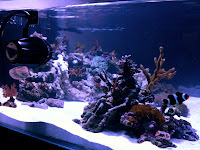 The pump is capable of pushing over 1500 GPH and in the 29 gallon tank running at half power is more than enough. Even more importantly the pump has a "feed" and "night" mode. Feed mode automatically reduces the pump power to almost zero for ten minutes while you feed then it instantly kicks back into its cycle ensuring no food gets blown into unwanted areas. 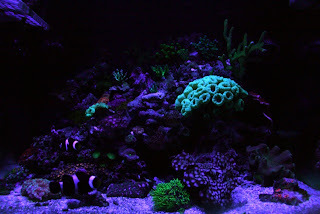 Night mode is even better, this time programmable mode prompts the pump to enter night mode which runs the pump at a constant low speed giving your corals and fish a rest when the lights are out. 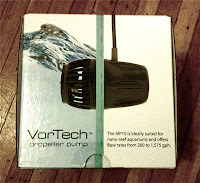 All and all, it is too early to tell if the pump will greatly improve life for those living in the 29G Cube, however at first glance it's an incredible little gadget and is a must have for anyone with a little extra cash and a dedication to their aquarium. 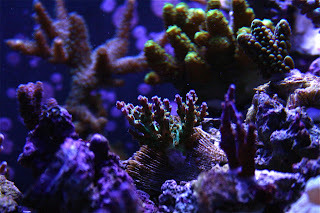 This blog is dedicated to chronicling the purchase, assembly, upkeep and evolution of a customized marine reef ecosystem. Please leave comments, questions and feedback as I would appreciate opinions or advice.